See original post at Delicaforum.com! I have been going shithouse lately between posting things and doing things to the Delica. This thread is for my latest install. I have wanted to turn the boost up for a while now, but I refused to do so without proper engine health monitoring. Therefore, I required a proper EGT and Boost gauge. 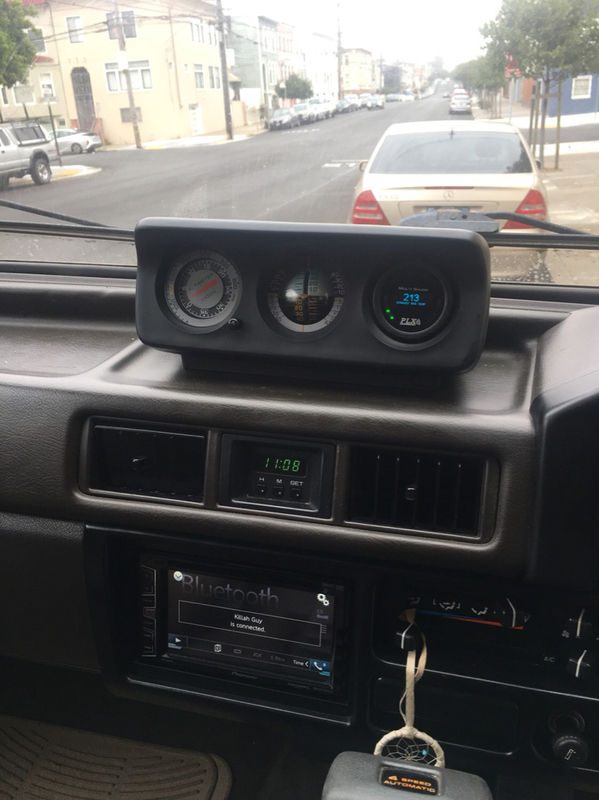 I did not, however, want two seperate aftermarket gauges present on or around the dash. I like the factory stuff and little else. So my search began. I found a cool line of products made by a company called PLX Devices. They have been producing high quality wideband monitoring products for a long time. I actually have an old LM300 digital wideband in my Lexus IS300 2jzGTE swap. Anyway, here is what I bought. Now, this setup is centered on a touchscreen gauge that you can buy. The idea here is to buy whatever sensor modules you want, string them all together, and broadcast their data to one gauge. Cool right? It gets cooler. They recently released a bluetooth application/dongle to allow streaming of sensor data to a freakin android or iphone. EPIC. This install uses the latter combination. Here we go! Step One. Remove the damn panel again. Step Two. Locate your EGT Sensor Probe install location.... Do you have an EGR Bypass?!?! BOOM! Step Three. Remove your EGR Bypass plate and start drilling. It tells you what size bit to use. Step Five. Install EGT Probe as far as you can into the plate. Last edited by Killbert on Sun Jan 08, 2017 6:48 pm, edited 1 time in total. Step Six. Install the plate and sensor probe back on the manifold. Step Eight. Did you buy the Boost Sensor Module? Obtain a vacuum tee and tap into the feed running into the top of the injection pump. This comes directly from the turbocharger compressor housing. Step Nine. Run the vacuum, EGT Probe wires through the small opening near the back of the firewall entering the battery well. Zip tie everything onto the main harness that runs into there. Step Ten. PROFIT. This is a screen shot from my android phone showing actual sensor data during driving! Freaking sweet. That looks pretty sweet. I am also looking for something like that. I recently installed a new stereo headset unit. Now I regret not choosing an android unit. Do they also make a coolant level sensor? I have to check out their website. I just looked up the PXL devices. Slick stuff. Makes me want it. I love stuff and I'm a sucker for a good gimmick. I might have to do my part for the economy and get a gauge set up. Many guys wonder what it is for so can someone give us more details as for why should someone add this in our Van ? How to get the most of it ? and what are the specific range of use in relation to our Delicas ? This is from the pro's. It's a good article and it goes really in depth. It also speaks about intercooling; a modification to the L300 that I highly recommend. Excellent how-to! Well documented and nice product choice. May have some questions after I read the links and do some research. But for now... thanks! My question was NOT about the EGT but about the Boost Gauge: what is the range of use, how to get the most of the engine using BG the readings, etc ? The gauge itself is a pretty flimsy piece of plastic that doesn't make the most solid of impressions. The instructions that came with it are completely useless. On the bench, I hooked it up at per the wiring diagram that came in the box, just to see, and it was dead. An email to support later I learn that you need to have a separate 8 Volt converter that should've been in the box but wasn't. According to support, you'll have to splice in this 8V converter module and cut some wires. All rather haphazard. So the gauge needs 3.3V, 8V and ground via the sensor serial cable, which is just a headphone jack. Odd stuff. In theory I like the idea of having one small gauge to display EGT and boost, or anything else they make a sensor for, I'm just not convinced of the quality of this particular unit. If you order just the gauge and EGT module, make sure to include the 8V dongle. The datasheet for the DM-6 on the web site says it is included with the standalone gauge but in mine it wasn't. Shout out to their support, they are shipping one for free. The sensor module itself makes a solid impression. I'm planning to hide it either in the engine bay or behind the dash. I just installed the PLX gauge with egt and boost sensors. I didn’t think the gauge itself was flimsy but you’re right the instructions are pretty horribly written. Lots of splicing and soldering. My gauge did come with the 8v dongle. It does mention you need it in the instructions but it’s written and worded so poorly I probably read them 50 times. In the end I put the gauge in the original pod where the outside/inside temp went and it works great. [quote="kyre"]I just installed the PLX gauge with egt and boost sensors. I didn’t think the gauge itself was flimsy but you’re right the instructions are pretty horribly written. Lots of splicing and soldering. No witchcraft, or clamps, just a good ol' hardwood spacer planed down to the exact thickness as the plastic temp innards I removed. 2" Forstner bit to sink the back of the gauge into the wood, a little silicone to hold the gauge in place, then the existing screws hold everything in from the back.